Washington (CNN) – When the Rev. Samuel Rodriguez talks about immigration, it is as someone who has witnessed the way a religious community is affected when a family is torn apart by deportation. Rodriguez, the head of the National Hispanic Christian Leadership Conference, has a naturally boisterous voice that booms with authority. When he speaks about immigration, passion oozes out of every syllable. But his voice softens as he speaks of those close to him who have been deported: an associate pastor's wife, a friend from Sacramento, California, a well-known congregant - the list seems committed to memory. Even as he relives the heartache, the pastor seems hopeful, if not optimistic. In the mind of many evangelical leaders, the reverend is right. The coalition is called the Evangelical Immigration Table and it is brought together a diverse mix of evangelical groups, including the Southern Baptist Ethics and Religious Liberty Commission, the National Association of Evangelicals, Sojourners and Focus on the Family. Though the groups began holding broader discussion two years ago, Monday will serve as the campaign's first concerted push on immigration, with the goal of getting meaningful immigration reform through Congress in 2013. That window, Land acknowledges, is small and could close at any point. Congress has a number of issues to deal with in the coming year; Republican members of Congress hope to focus on government spending and the debt, while the White House is likely to push for gun control early in the president’s second term. Land, however, says that isn’t an excuse. Since the group's launch last June, organizers have been fundraising and placing people in three states, Colorado, Florida and Texas, to lay the groundwork with local evangelical leaders and politicians. By making these early investments, coalition leaders hope there will be a highly reactive group of evangelicals ready to push for immigration reform. In addition to local networking, these evangelical leaders have begun lobbying leaders in both the U.S. House and Senate and plan to do more “grass-roots lobbying,” including bringing people to Capitol Hill in the future. According to Jim Wallis, CEO of Sojourners and a leader in the coalition, the group has met with “top-level White House officials” as well as Democratic and Republican leaders "from Chuck Schumer to Lindsey Graham." For Richard Land and other coalition leaders, this is not just a moral issue, it is also biblical. The campaign will release a video on Monday that features more than a dozen evangelical leaders reading the text of Matthew 25:31-46. “When the Son of Man comes in his glory and all the angels with him…” reads Max Lucado, a well-known evangelical pastor and author. “He will sit on his glorious throne, all the nations gathered before him…” continues John Perkins, an evangelical author and speaker. In addition to the video's release, the coalition organizers have asked local leaders to encourage their congregations to take the “I Was a Stranger Challenge.” Those who take the challenge will receive daily verses of scripture that might apply to the immigration issue – with the hope that they will use them in prayer – and a “Toolkit” to help spread the word on the need for immigration reform. “So God created mankind in his own image, in the image of God he created them; male and female he created them,” reads the first text, citing Genesis 1:27. “After this I looked, and there before me was a great multitude that no one could count, from every nation, tribe, people and language, standing before the throne and before the Lamb. They were wearing white robes and were holding palm branches in their hands,” reads the last text, citing Revelation 7:9. Pastors are also being urged to use their sermons to speak about the need to help "strangers" and relate immigration reform to Christian values. In total, the organizers believe the campaign will reach more than 100,000 churches. Coalition leaders also see the 2012 election results, particularly the fact that Republican nominee Mitt Romney struggled mightily among Hispanic voters, as a powerful tool they can use against reluctant politicians. Land, who has long counseled Republican presidents on religious issues, says he plans to use the 2012 election to his favor when talking to legislators. “We plan to point out that if the GOP ... wants to be a viable national party in the future, then it is going to have to get more Hispanic votes then it did in the last election,” Land said. When asked if he is comfortable with getting immigration reform passed by using political and election bargaining, Land laughed. “Maybe [the Republican Party] should do the right thing for the wrong reasons,” he said. But Republicans are not the only group faced with changing demographics. Evangelical Christians, too, are seeing the makeup of their churches change drastically. 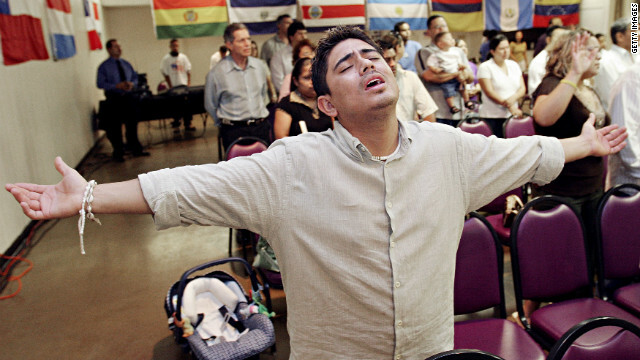 Nearly one-fifth (19%) of Hispanics in the United States identify as Protestant, a Pew Research study found in 2012. On top of that, Hispanics are nearly twice as likely to say they are “born again” or evangelical as opposed to mainline Protestant. Though Hispanics are still more likely to identify as Catholic – 62% do so, according to Pew – evangelical leaders say they see signs that the number of Hispanics in their churches will only grow in the future. “The growth in most of our churches is because of immigration. That is the future of our churches,” Wallis said matter-of-factly. That change is evidenced in the ethnic makeup of the coalition’s leadership. Luis Cortés, president of the evangelical group Esperanza, Gabriel Salguero, president of the National Latino Evangelical Coalition, and Rodriguez, president of the National Hispanic Christian Leadership Conference, all signed on to the group early. Additionally, many of the local pastors are from primarily Hispanic churches. A racist like Richard Land wanting to work on immigration for non-white people? That's hard to believe. "In the mind of many evangelical leaders, the reverend is right." No, he is not! I am sick and tired of supposed (and even genuine) Christians telling the world that the Bible supports people BREAKING THE LAW to come here illegally, live here illegally and take advantage of tax-paying citizens, ILLEGALLY! What a slap in the face to countless people who have waited for YEARS and spent untold amounts of money to come here the proper, legal way! The "stranger" referred to (least of these my brothers) is a fellow Christian. The verse refers to private benevolence within the Christian community, not a political mandate to suspend the rule of law with respect to immigration. The strangers mentioned in the Old Testament, to be welcomed, were foreigners who agreed to abide by the laws of Israel. Ancient Israel was under no madate to dissove itself into multicutural anarchy–and neither is our country. The religious leaders who promote amnesty for illegal aliens, i.e., rewarding lawbreakers with U.S. citizenship are not serving God. Wittingly or unwittingly, they are undermining their country for the benefit of ethnic chauvinsts, cheap labor interests, and left-wing politicians who seek cheap votes. Yes! Why doesn't anyone seem to get this?! This is long overdue. Beginning with Abraham's covenant and the Law of Moses, God's people have been called to show love to aliens. The evangelical church has long been behind the curve on this due to the so-called "Christian Right" agenda. Immigration reform is about economics and security, as well as morality: economics, because the economy provides jobs and demands currently "illegal" workers, so we should find a way to legalize them and bring in the required labor legally going forward. Security, because if we can get most of our immigrants to come through the door, there will be far fewer crossing the desert or stowed away in ships, and it will be far easier to ID and stop the drug mules and terrorists. Legal immigrants ultimately cost the system less, pay more in taxes, and allow ICE and law enforcement to focus on real threats. "Aliens" like the Canaanites? You all can keep that kind of "Love". You're right, it's an economic issue. In 2008 when the "Great Recession" started there were an estimated 18 to 22 MILLION illigals here. When the economy soured alot of them went home. There are still an estimated 7 MILLION in jobs that our citizens could be doing. With the unemployment rate still hovering around 8 to 8.5 % this has been a mostly jobless "recovery", if you can call it that. Big Business wants illigals here to drive down wages and benefits, paying them cash under the table. They don't pay taxes. "Comprehensive Immigration Reform" is just a fancy way of saying Amnesty. Reagan did it in the '80's; Clinton in the '90's, both resulting in a massive influx of more illigals. Reform needs to start with making the E-varify system manditory for all businesses and securing our borders. I think these Catholics should be targeted directly at the atheist stong holds; for settlement. Take a lesson from our Jewish brothers. What's an atheist stronghold? The public library? The illumined ones are neither religious nor atheistic. They see things in terms of centuries rather then in just simplistic yearly visions. The finalized culmination of the illumined ones are for globalized unity in all governances being abridged with unification among all nations. The illumined ones hide from our views and do not bode well within the lime lights. They hide just within the reaches of governments' personages. Common people could care less who rules just as long as their life needs are met. All things which the illumined ones care about has little issue with the commonalities of people's needful issues. Okay, I'll bite. What's the lesson from "our Jewish brothers?" Sometimes lamp oil lasts longer than you thought it would? Or find a way to dominate banking and Hollywood? Not the parents, but when the kids start going to university they'll come into more contact with atheists. Unfortunately for your plan, once they get into real universities many of these kids will realize that God isn't real as well. John P. Tarver is not a true Christian. He is clearly a racist with a lot of hate and no compassion. Lisa it is the acme of foolishness to assume JPT practices a religion any more or less true than yours. It is only that he is a Dapper Dan man and you, a Fop. Same stinking hair gel, different brand.